PARIS (Reuters) - European planemaker Airbus is set to lose its only Japanese customer for the A380 superjumbo as Skymark Airlines prepares to cancel an order for six jets worth more than $2 billion (£1.18 billion), industry sources said on Monday. The setback comes after Japan's third largest carrier swung into a loss for its latest financial year and raises new questions over the strength of the backlog for the world's largest airliner, which increasingly depends on one customer, Emirates. An Airbus spokesman declined to comment on the threat to the Skymark order, which was first reported by Bloomberg News. The news comes as aerospace sources say several other orders for the huge jetliner are already hanging in the balance, including 10 aircraft earmarked for Hong Kong Airlines. Reuters reported earlier this month the Hong Kong carrier no longer wanted the jets after an associated leasing company struck an expanded deal to buy 70 smaller A320-family aircraft. Since March the order has no longer been attributed to Hong Kong Airlines, but to an "undisclosed" customer, raising questions over its status, according to a review of Airbus data. Airbus officials said at the Farnborough Airshow this month that the Hong Kong order remained on its order book. Skymark was due to take delivery of its first A380 around the end of this year, but the airline said in June the delivery was pushed back by up to six months because of problems in fitting out the interior of the world's largest jetliner. Industry sources say Skymark, which has reported its first loss in five years, faces a challenge in taking delivery of the A380s, which were worth around $350 million each at list prices when the carrier placed its firm order in 2011. Airlines pay most of the cost of buying a jet on delivery. No one at Skymark Airlines was available for comment. The A380 has so far attracted little interest from low-cost carriers, which operate with fewer of the partnership agreements and loyalty programmes that help traditional network airlines sell tickets and make the 525-seat jet profitable. The Centre for Aviation (CAPA), an airlines consultancy, has warned that Skymark could encounter "significant losses" if it put the A380 into service without such agreements, and that the airline would need changes in strategy to make it viable. Adding a new aircraft type adds cost and complexity in training, maintenance and spare parts. Even large airlines can take years and dedicate large teams to preparing for the huge jet. Skymark, which mainly flies Boeing 737s, has already tested its flexibility by adding two leased wide-bodied A330s. The four-engine, double-decker A380 was launched in 2000 as a solution to Europe's congested airports and the success of Boeing Co's 747. But growth in demand for large twin-engine jets has weighed down sales, which also suffered because of technical problems and the financial crisis, during which many airlines avoided large-scale bets. The notable exception is Dubai's Emirates, which has invested in 140 of the aircraft, more than five times the number ordered by the next largest customer, Singapore Airlines Ltd. The Dubai airline has said the A380 has unbeatable economics when configured correctly, and has asked Airbus to come up with a more efficient version with new engines from end-decade. But the remaining backlog of 135 aircraft, of a net total of 324 ordered so far, includes several smaller orders that analysts say look increasingly unlikely to be delivered - at least to the airlines that originally purchased them. Besides the aircraft originally earmarked for Hong Kong Airlines, these include a remaining eight for cash-strapped Qantas Airways Ltd, six that Virgin Atlantic has said it may further delay, two for Reunion-based Air Austral, and one originally sold as a flying palace to a Saudi prince. Despite the setbacks, leasing company Amedeo has ordered 20 superjumbos in the belief there is an untapped market for A380s in a denser and more efficient cabin layout. While Airbus tries to steady the backlog for its largest jetliner, it faces continued technical headaches from the complex aircraft such as a recent problem with leaking or noisy doors. 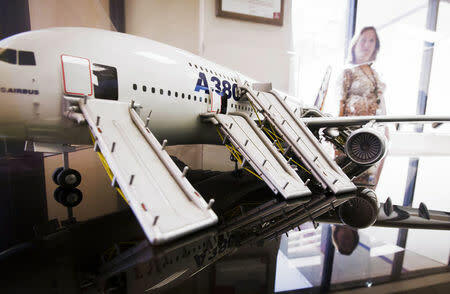 Airbus said at this month's UK air show that it was testing a solution after a recent diversion and several incidents involving noise onboard and expected it to be ready this year. But influential customer Qatar Airways has raised concerns about the doors at the same time as refusing to take the first three aircraft because of what it describes as problems with the cabin, two people familiar with the matter said. Airbus has said it is confident of reaching its target of 30 A380 deliveries this year, including the aircraft for Qatar.